My primary goal with this contest is to find a designer for this new non-lethal weapon. If all designs are suitable, the designer will be the lead designer for this weapon project. This project has a sizeable upcoming contract with some serious investors, so this will be a lucrative opportunity for the chosen lead designer. This is a non-lethal weapon; the gun can shoot electric shocks & pepper spray balls. I have a previous design that looks decent but I want to take step it up a notch. I want a design variation, maybe some additional light inputs, some redesigns, some designs where the trigger is matte black along with other color changes. 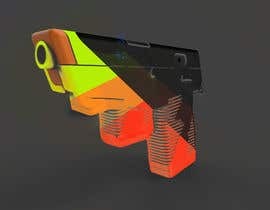 Basically, I want a designer to greatly improve my current design, I also want the designer to make different variations of the gun, I also want the designer to implement some new color variations for the gun as well, all colors should be in matte. hi , how are you ? any commnets ?